Have a Halloween party coming up? Here are some storytelling tips to help you extract more screams from your victims. Whether it’s shining a flashlight on your face, or getting someone to do a jump scare…here are six tips that’ll bring more bite to your bark! Once you have found or created your story, make it relevant to the area you are in. For instance, if it’s based in a forest, chose one local to you. If you really want to creep your audience out, try subtly dropping hints about the places in your story in the days leading up to when you tell it. If you happen to walk past one of the locations, complain about feeling a cold chill, or hearing an odd noise. This is especially true if you’ve never told a scary story before. You’d hate to find yourself stumbling just as you reach the scariest part. If you really want to go the extra mile, rehearse the story in front of a mirror or record yourself and watch it back. If you can spook yourself, you can spook anyone. The tradition of telling stories can be traced back to when our ancestors were hunter-gatherers. At night not much could be done so instead they would socialize around a fire and tell stories. Social storytelling took a spookier turn in Victorian times when ghost stories became the genre of choice. In this era gas lamps were used for lighting and these lamps were known to emit carbon monoxide which provoked hallucinations making the stories very…immersive. Perhaps don’t opt for poisoning your audience with an old gas lamp but keep it traditional and use a lantern. Of course the old, shine a flashlight up at your face from below, trick works a treat too. Rain has a habit of coming down at undesirable times. If rain has brought your storytelling inside, fear not, you can still keep things creepy. Leave a loose window or door open in hope that the wind will slam it shut and make everyone jump. Plus you’ll see how people will keep a watchful eye on the curtains blowing around in the breeze. This is also likely to give your audience literal goosebumps as you tell your story, just be sure to have blankets and hot chocolates ready to warm them up afterwards. 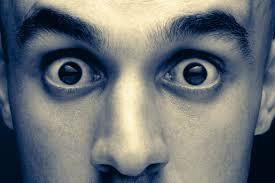 Research finds that a person feels most comfortable with eye contact that lasts 3.3 seconds. Any longer and people begin to feel unsettled. Put this to your advantage and hold someone’s gaze for slightly too long. Try 5 seconds, 6 seconds, whatever you’re brave enough to try! Just before you get to the story’s climax, stop for a few seconds, remain quiet and still as the anticipation rises and then deliver the killer ending. We hope these tips help you deliver a story to remember this Halloween. Got any Halloween party plans? Visit our Halloween stores this year for not only the best Halloween costumes around town – but props and horror stories that’ll keep you up at night.